What can I do about a lens cap which keeps falling off? I carry a single camera with a single lens protected by a 52mm snap-on front lens cap LC-52. I typically walk in cities and museums from morning to night, taking time to compose a picture every 30 minutes or so. I almost never need to take a picture quickly. Unlike more serious photographers who use a bag and never use the lens cover when the camera is outside of it, I don't have a bag and I prefer to have the cap on during the 30 minutes of not taking pictures, for various reasons that are not the topic of my question. Now 6 months after buying it, the cap has not been taken off more than 500 times, but already it has started falling off very easily. Simply touching it with my sweatshirt's sleeve makes it fall. It is not attached so every time I have to hunt for it on busy sidewalks or in the sand or bushes. Is buying a new one every six months the only solution? The cap is sold for 17 USD on the Nikon store. Is there any trick to make the lens cap last longer, or to "fix" it so that it holds better? Lens caps are for use on lenses that are in storage. They are not meant to be used on lenses that are in use, such as when attached to a camera. As you have experienced, they are not particularly resilient, they are easily detached in the field, and they are easily misplaced. In the environments you describe, city and museum walks, obsessive use of lens caps is more likely to damage the lens than simply leaving them off, especially after they are likely to have picked up grit after being retrieved from "sidewalks or in the sand or bushes". Use transparent lens caps (aka, "UV" filters). They cost a bit more than ordinary lens caps. Make sure it is multi-coated. Use neoprene lens caps, which Chris H mentions. You can purchase ready made "LensCoat Hoodies", or DIY from a bottle holder. Some people use lens hoods to "protect" their lenses. How well this works depends on the specific perils your equipment faces. Lens hoods should be sufficient for city strolls and museum walks. Use cap keepers, as osullic suggests. However, some find that a cap dangling from the lens is annoying. Looks like a pack of 15 costs less than a pack of 5? Purchase your own photography gear so you won't be subject to the whims of others. By having your own equipment, you also avoid damaging others'. This will cost you a bit more up front, but could save you some in the long run. Out of appreciation to the owner for letting you use their camera, buy a new Nikon 52mm lens cap to replace the one you have worn out.¹ Place that cap on the lens whenever you are returning the camera to its owner. Buy a few cheap generic 52mm lens caps. They can be had for very little cash when you buy a few together. It probably costs a seller more to prepare and package your order than their wholesale cost of a single lens cap. I prefer the center pinch type. Use one of those caps when you are out shooting. When one wears out, throw it away and start using another. ¹ As suggested in a comment by Horitsu. I'm gonna go full Freudian here and suggest that the lens cap is not your problem here but rather the relationship with the owner of the camera. Get your own gear even if it is used or of lower specs (remember that the 450$ Nikon d3400 with the kit lens is more capable a camera than any owned and operated by Henry Cartier Bresson throughout his career). Depending on what would be less strenuous on your relationship with the owner either return him his camera+lens thanking him appropriately or keep it safely stored with the lens cap on at your place while using your own gear. Not the answer you're looking for? Browse other questions tagged nikon nikon-d5300 lens-cap or ask your own question. 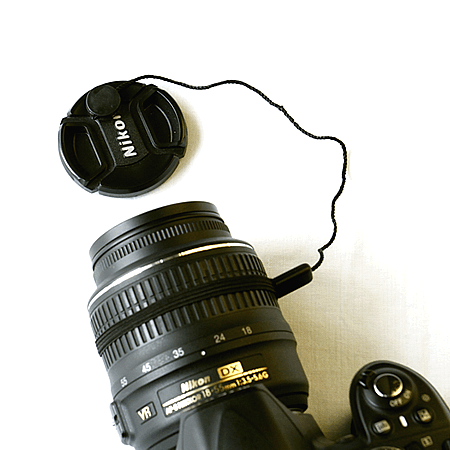 How can I find the right lens cap for my lens? How to remove sand from the lens cap? Should the lens cover / lens cap be on the camera while inside a dry box / dry cabinet? Lens cap alternative to Canon cap which won't risk damaging my filter? Which lens cap do I need for an Olympus 14-45 f/3.5-5.6 lens? What do the setting need to be on my Nikon D5300 to use off camera flash using Younguo triggers?